BareBones OEM – Barebones OEM Inc.
Barebones OEM is a leading manufacturer and systems integrator of server, storage and networking products and solutions for Data Centers, Cloud providers, and Enterprise companies. Barebones OEM white labels and resells systems and services for clients such a telecom carriers, data centers, and system integrators, providing direct end-to-end solutions from a single, trusted source. We offer a full suite of products to meet your needs, from full server and storage systems, workstations, and networking systems to a complete range of interconnect and cabling products. Barebones OEM systems are designed and built using only the highest-quality components available from market leaders such as Intel, Samsung, Seagate, and Mellanox, Broadcom and Avago. Our bespoke systems enable customers to choose the optimal solution that fits their technology and business objectives. Our customized solutions deliver high performance while managing total cost of ownership and generating maximum ROI. Barebones OEM also partners with leading solutions providers such as HP, Huawei, Juniper, and Cisco, providing solutions from edge to core routers and switches, WLAN, and security. We are dedicated to building state-of-the-art cloud and enterprise computing platforms. Barebones OEM offers a broad range of managed services from system commissioning to architecture, security assessment and infrastructure planning and life cycle management. Critical outages in IT systems negatively impact any business. At Barebones OEM, our managed service approach focuses on the prevention of these issues before they disrupt employees, management and clients. As every managed service engagement is custom, please contact us to see how we can accommodate your business needs. Having your equipment turn up to site ready for deployment, plug and play, can save you time and expense, not to mention should a component fail. Let us take care of that for you. Our configuration center located in Norwalk Connecticut, offers server, storage and networking configuration services. Including BTOaaS build to order as a service and bespoke customer design to delivery and rack and stack. Barebones OEM offers a broad range of managed services from system commissioning to architecture, security assessment and infrastructure planning and life cycle management. Critical outages in IT systems negatively impact any business. At Barebones OEM our managed service approach focuses on the prevention of these issues before they disrupt employees, management and clients. As every managed service engagement is custom please contact us to see how we can accommodate your business needs. Barebones OEM offers a full line of server solutions, from HP, Huawei, SuperMicro and IBM. Whether entry level or high performance compute we can meet your server requirements. Our configuration center can custom build to provide the best solution for industry specific needs. 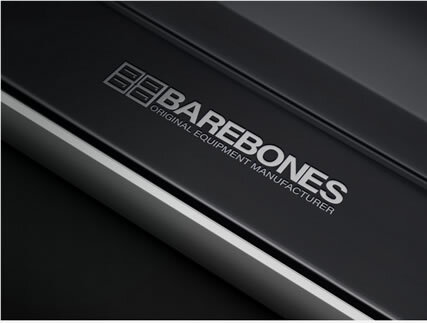 Barebones OEM also offers equivalent USA specification servers custom built to the highest standards here in our Connecticut facility. Increasing both quality and value proposition for customers, and giving you peace of mind that comes with a full 3years onsite warranty. More and more devices globally are being connected, the IoT, internet of things, is driving M2M in areas such as video surveillance, smart home, smart business and smart city technologies. As more and more data. Voice and video flows over these networks is increases the need for bandwidth. Networking be it physical or virtual is the corner stone of any business and utilizing 10G/40G/100G gives companies an advantage in a very competitive marketplace. At Barebones OEM we understand the need to be competitive yet remain budget conscious, as traditional networking solution can become expensive. That is why we work with vendors like Huawei to provide robust, scalable, high performance networks that you can rely on. Core to Edge, wlan and security, please contact us to find out more. The need for enterprise storage has never been greater, as more and more data is being digitized than ever before. The convergence of cloud, virtualization, big data analytics, mobile and social media are all driving change within the IT data storage landscape. From SAN to NAS, disk to hybrid and all flash arrays barebones oem provides storage solutions from leading vendors like HP, IBM, Huawei. Whether cloud or on premise we can build the right solution to meet your needs. Adopting a cloud first approach can enable a business to free itself from the need to manage IT assets and applications and focus on their core business values. The economies of scale and pay as to go model offered by the cloud can also help companies dramatically reduce their capex. But with the cloud offering so many possibilities which is the best one for your business? At barebones oem we offer true enterprise class storage as a service STaaS, which can be deployed either in a cloud or on premise in your own private cloud. We also offer Desktop as a service DaaS and VDI deployments. Please contact us the learn more about our portfolio of cloud solutions. Barebones OEM provides a full range of server, storage, and networking products for data centers, cloud providers, and enterprise companies. 1U and 2U rack servers featuring the latest Intel processors offering outstanding scalability and management. Ideal for telecoms, financial services, and large-scale enterprises. 4U 4-way advanced servers for highly virtualized environments. 7U 14 compute node blade system with Intel 5600 processors. A high-performance blade system with low power consumption provides an efficient, cost-effective solution for the enterprise data center..
IP SAN/NAS storage systems with Ethernet iSCSI and FC interfaces. MSA compliant 1G/10G/40G and 100G transceivers and fiber optical cabling solutions. Direct Attach Cable (DAC) cabling 10G and QSFP+, offering high bandwidth, low latency solutions for today’s data canter and storage applications. Server upgrade options, 1G and 10G network interface cards, either fiber or copper in dual and quad port options. Server memory, enterprise class HDD and SSD. Encompassing a career spanning more than 20 years in IT Hardware Distribution and Manufacturing, CEO, has sold over $1b in Servers Storage and Networking Product. Justins loyalty to his customer and supplier partners, his reputation for honesty and integrity are evidenced by many years of repeat business from Fortune 500s, Government, Manufacturers and Resellers across the globe. A keen skier with a passion for environmental conservation, Justin is a husband and proud father. With a career spanning 20 years in Distribution Product Management, System Design and Implementation, Peter has had enormous success in delivering the right results to his global partners. Recent successes include founding the European arm of a multinational distributorship for the $55 billion Huawei brand before beginning his new venture in to the USA market with Barebones OEM. A keen Marathon runner, and trans-Atlantic traveler, Peter is a husband and proud father. We partner with leading solutions providers such as HP, Huawei, Juniper, and Cisco, providing solutions from edge to core routers and switches, WLAN, and security.